This is an image of particles from a transformer oil sample. The orange particle is limonite and the white particle is degraded, end-of-life paper. 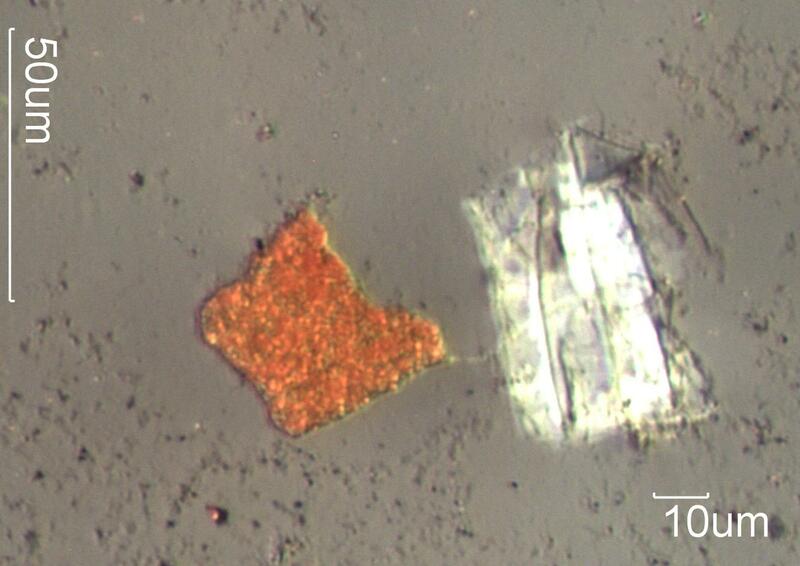 There is also a small copper arc particle below the limonite particle. This transformer has corroding iron, degraded paper insulation, and some arcing involving copper. The arcing event was fairly low in energy as indicated by the small size of the arc sphere. Limonite is the first form of iron corrosion product evident in a corroding transformer. It is an iron hydroxide with waters of hydration. The initial form is pale yellow in color. As waters of hydration are lost it becomes more orange and will eventually become hematite (Fe2O3). This limonite particle shows the nucleation of crystal sites. It has released water and hydrogen back into the system. There is some low level arcing going on in this transformer as indicated by the small arc sphere.